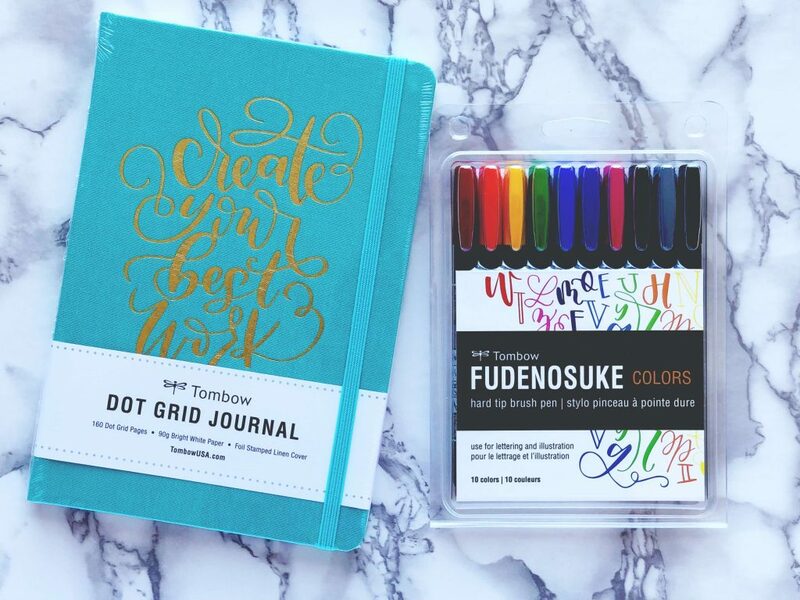 Tombow Fudenosuke COLORS & Tombow Dot Grid Journal: Calligraphy Giveaway. Today is my birthday! And to celebrate I want to give YOU a pack of 10 Hard Tip Tombow Fudenosuke COLORS & a Tomboy Dot Grid Journal. If you want to skip the story and get right to the giveaway, then scroll all the way to the bottom! Today is my birthday!!! I’m SO grateful and blessed to have another year of life. And I need to make it my best year yet! I have big goals and plans for this new year. 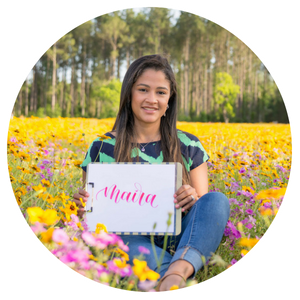 For starters, I’m eager to merge my new passion of blogging with my love for calligraphy. As a result, I’ll be posting more often here and sharing everything I’ve learned in this journey with you. This giveaway is not sponsored in any way by Tombow USA. I just love their products so much. I recommend Tombow products to everyone wanting to learn hand lettering and calligraphy. If you want to know which are the best brush calligraphy pens for beginners, I made a list of them for you in this blog post. Last month Tombow made an incredible announcement I’ve been waiting for (ever since I started lettering)… They introduced the Tombow Fudenosuke pens in COLORS! For the longest, the Tombow Fudenosuke brush pens only came in black and gray. But, Tombow listened to their fans and the wait is over! 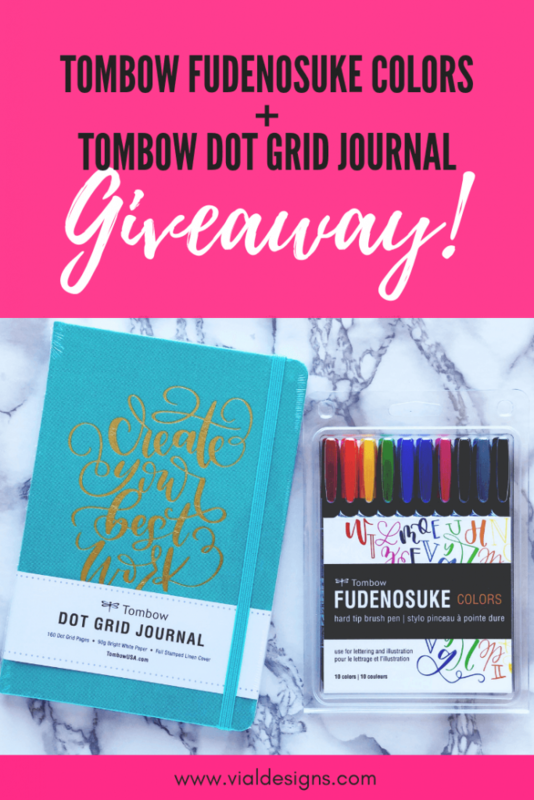 I want to share the love with you by giving away to a lucky winner a set of Tombow Fudenosuke COLORS & Tombow Dot Grid Journal! Some Legal Stuff: This giveaway starts today November 27, 2018, and ends December 3, 2018, at 11:59 PM EST. I will select the winner randomly using Random.org, and the winner will be notified via email. But, the winner has 48 hours to respond before a new winner is chosen. Tombow USA, Facebook, Pinterest, Instagram are in no way associated with this giveaway. By providing your information in this form, you are providing your information to me and me alone. We do not share or sell information. We will use any information only to contact the winner. Giveaway open to U.S. & Canada Residents only. See the full terms and conditions here. P.S. I’m sorry to you my international friend! Rules and giveaway laws stink sometimes, and I have to stick to them for now.